For four centuries, Spynie Palace was the fortified residence of the Bishops of Moray, standing some two miles north of Elgin on the edge of Spynie Loch, a sea loch providing direct access and a safe anchorage. 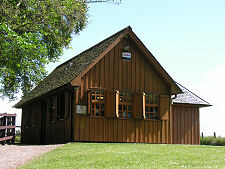 It was also the centre of a thriving settlement. Today the splendid ruins of the Palace remain, but the loch is only a shadow of its former self and the medieval town has disappeared. A Bishop of Moray called Giric or Gregory appears in the records as early as 1120. 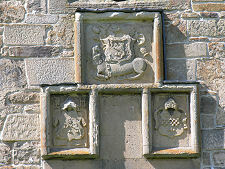 The early bishops had no fixed residence, instead basing themselves as needed at the churches of Spynie, Kinneddar (on the edge of today's Lossiemouth) and Birnie (south of Elgin). In 1208, Pope Innocent III agreed that Bishop Brice of Douglas could settle on the Church of the Holy Trinity at Spynie as his Cathedral. In 1224 the Pope agreed to a recommendation from Brice's successor, Bishop Andrew of Moray, that Holy Trinity Church in Elgin should be designated as the cathedral for the Bishopric of Moray. It seems, however, that though Bishop Andrew felt Elgin to be a better location for his cathedral, he liked the convenience and relative quietness of Spynie for the bishop's principal residence, which as a result remained here. Quite what form this residence took at this time is unknown, though there a reference in a document from the late 1200s to "Spynie Castle". In 1362 we know that Bishop John of Pilmuir entertained King David II in the bishop's castle at Spynie, and that later the same year he died there. 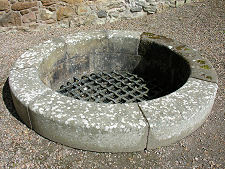 In 1390 Elgin Cathedral was burned down, with much of the rest of Elgin, by the Wolf of Badenoch. This was the name given to Alexander Stewart, the younger son of Robert II. The Bishop of Moray, Bishop Alexander Bur had caused him to to be excommunicated for marital infidelity, and this was his way of getting even (see our Historical Timeline). 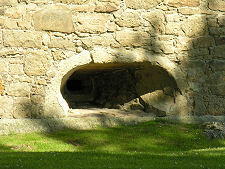 It is not clear whether Spynie Castle was attacked at the same time. 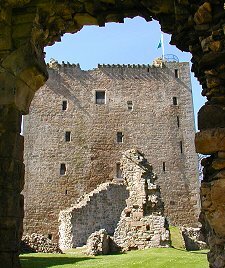 During the 1400s both James I and James II stayed at Spynie Castle while travelling in the north of Scotland. Most of the Bishops of Moray during the 1400s were preoccupied by the rebuilding of Elgin Cathedral, but Bishop David Stewart, who served from 1462 to 1476, took it upon himself to completely redevelop Spynie Castle as a bishop's palace. 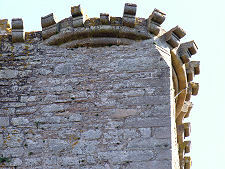 What Bishop David inherited was a castle comprising a massive curtain wall with a circular tower at each corner. 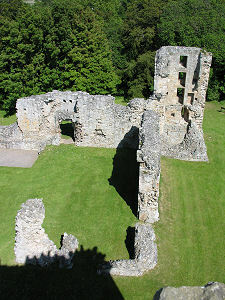 Built into the inner faces of the curtain wall would have been the castle's accommodation, including a great hall, the Bishop's residence, and service quarters. Bishop David transformed this with the building of what is now called David's Tower, completed by his successor Bishop William Tulloch. 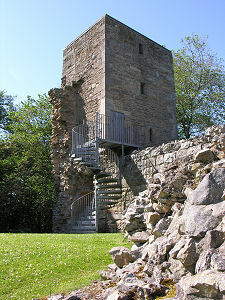 This measures 19m by 13.6m and is 22m high, making it one of the largest tower houses in Scotland. 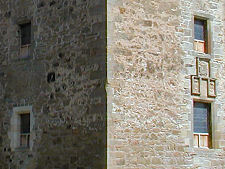 The tower served as a Bishop's palace, providing his living and working accommodation. 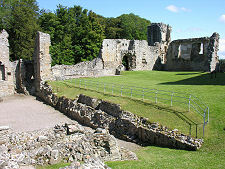 By the end of the 1400s the rest of the old castle had also been transformed, with the building of a great hall as a north range and the addition of a chapel. Meanwhile, the surviving round towers were replaced by square towers and the old south gate was replaced by a magnificent new east gate. 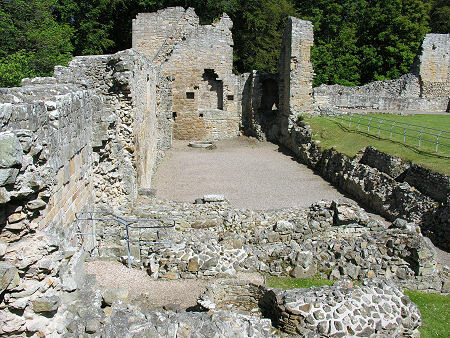 James IV stayed at Spynie Palace in 1493 and 1505 while on pilgrimage to the chapel of St Duthac chapel at Tain. In 1538 the man who would become the last Catholic Bishop of Moray, Patrick Hepburn, was appointed. On 17 September 1562 Mary Queen of Scots stayed at Spynie while campaigning in northern Scotland. 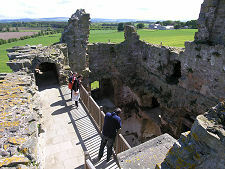 During the summer of 1567 the Bishop's kinsman and the Queen's new husband, James Hepburn, 4th Earl of Bothwell, sought refuge at Spynie Palace while fleeing north in the aftermath of the arrest of Mary Queen of Scots. The Bishop's three sons (and it says much about the times that a Catholic bishop should have three sons) turned against him and Bothwell responded by killing one of them and briefly taking control of Spynie Palace, before continuing a flight that would end in a prison in Norway. The first Protestant Bishop of Moray, George Douglas, was appointed on the death of Patrick Hepburn in 1573. These were, however, troubled times, and conflict flared frequently about whether the reformed Kirk in Scotland should be governed by bishops as an episcopalian church, or by elected elders as a presbyterian church. James VI managed to keep a lid on the simmering conflict during his rule, but his successor Charles I treated the Scottish Kirk in such an offhand manner that he provoked what became known as the "Bishop's Wars" between England and Scotland, which led directly into the Wars of the Covenant; the English Civil War; the execution of Charles I; and Cromwell's occupation of Scotland: 23 years of wide-ranging conflict that did not really end until the restoration of Charles II in 1660. Episcopacy (rule of the church by bishops) was restored in Scotland in 1662. The last Bishop of Moray, William Hay, was appointed in 1688. The following year an Act of Parliament ruled that the Church of Scotland should henceforth be a presbyterian church, and all existing bishops, including William Hay, lost their jobs. 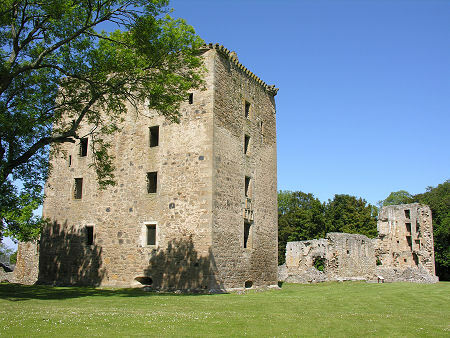 The conflict and uncertainty of the middle decades of the 1600s had led to the physical decline of Spynie Palace, and with the demise of the bishops it fell further into disrepair. Efforts to preserve it began as early as 1828. 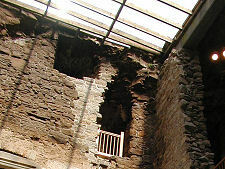 Since 1973 the ruins have been in the care of Historic Environment Scotland. For today's visitor Spynie Palace still has a remarkable grandeur. The massive David's Tower is the highlight, and the views afforded from the top, both of the surrounding countryside and the rest of the palace, are magnificent. When we first visited Spynie in 2001, David's Tower was covered with a translucent plastic roof, and had half glazed and half shuttered windows fitted. 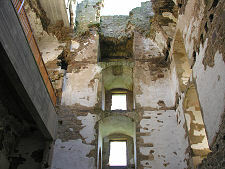 Some time later the roof was removed, as it was considered not in keeping with the historical integrity of the ruin, and the windows were also removed as they had no purpose without a roof. 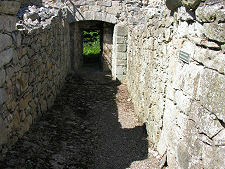 We understand why it may be felt that a modern roof should not be built over a ruin where one does not already exist. But spending money to remove a roof and windows installed when a different view prevailed, and in the process making the building more vulnerable to the elements and to bird droppings, seems a more questionable thing to do.